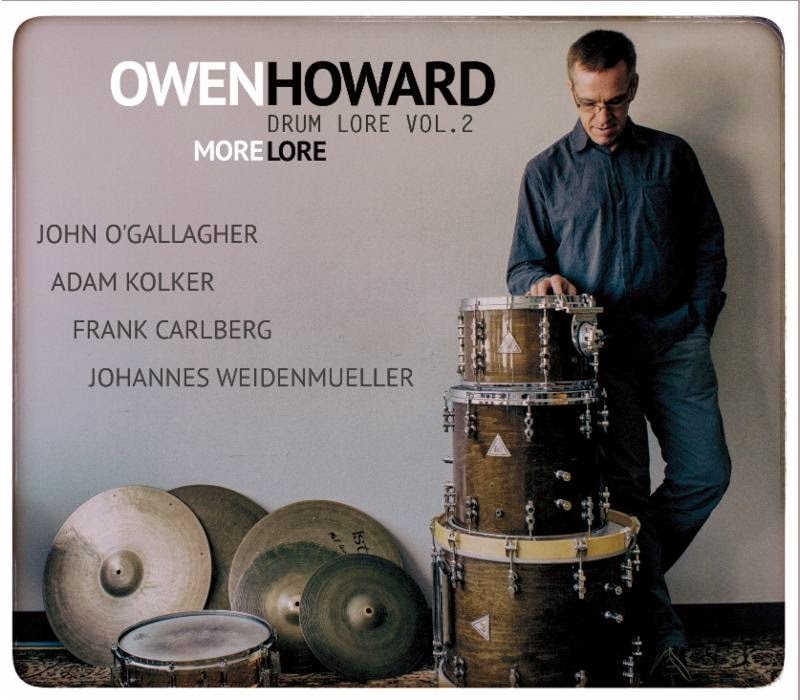 It's been over 4 years since drummer Owen Howard released "Drum Lore", his musical "love letter" to the drummer/composers who influenced his playing, writing and arranging. It remains one of my favorite recording of the decade and I still listen to it on a regular basis. Bless my soul, here's"Drum Lore Vol.2: More Lore" (BJU Records) and, while the program pays tribute to more of Howard's favorites, he also includes 4 original compositions and uses his "working quintet" of John O'Gallagher (alto saxophone), Adam Kolker (tenor and soprano saxophones, bass clarinet), Frank Carlberg (piano) and Johannes Weidenmueller (bass). The band plays compositions by Joe Chambers, Victor Lewis, Paul Motian, Tony Williams and "Philly" Joe Jones, all of whom (except Jones) are known for writing much of their material for their groups (although Motian recorded a slew of standards and Broadway tunes). Howard's arrangements don't veer much from the originals save for speeding up Williams's "Pee Wee" and changing the time signature on Lewis's "Hey, It's Me You're Talking To." Howard pays tribute to Motian in his intro to the late drummer's "Mumbo Jumbo" and, although most fans don't need reminding, it's fun to hear someone else Motian's unique music. Just as impressive as the "tributes" are the original pieces. "Plus/Minus" opens the CD, an uptempo romp that gives everyone a chance to just "blow." "Haiku" (which appears twice on the program, the second time as the solo piano piece at the end of the CD ) has a lovely melody played by the alto sax and bass clarinet with bass and piano offering counterpoint over Howard's active brush work. The funky reworking of Sonny Rollins's melody "Oleo" into "Like Buttah" (honest) features a staggered beat, strong work from Kolker (tenor) and O'Gallagher with Carlberg pushing and prodding at the piano. Weidenmueller keeps the beat straight while the leader gets to play. The rhythm section falls into a boppish beat for Carlberg's excellent solo. There's a "free" approach to the group interactions on "Labyrinth" with all 5 playing melody lines (yes, even Howard at the drums) until one by one they fall into the "Mwandishi"-like groove for the melody. Another change in tempo leads to solos by Kolker (bass clarinet), Carlberg, Weidenmueller and concluding with O'Gallagher. All the while, Howard plays creatively and with great taste, keeping the music fresh and exciting. This creativity happens because these 5 musicians are comfortable with each other, know each others strengths, understand they can go as far as deep into the music as possible because of trust (and talent). "More Lore" reminds one that musicians can go back to their roots and make their explorations sound fresh and relevant. Owen Howard and his talented cohorts have a great time bringing this music to life; it's a joy to listen to. For more information, go to owenhoward.net. Nathan Parker Smith, a native of northern California, formed his Large Ensemble in 2009, a 17-piece band that just about blows down the house on its debut CD, "Not Dark Yet" (BJU Records). Darcy James Argue has described the music that his Secret Society plays as "steampunk" - well, this recording is really "punk steampunk." 11 tracks in just under 37 minutes, only 1 over 5 minutes and 4 under 3 minutes, all original compositions, this program challenges the listener's understanding of what a large ensemble can do. You'll recognize some of the names from their own work or other big bands. The trumpet section includes David Smith and Matt Holman, both of whom have recorded for BJU while trombonist JC Sanford just issued one of the best recordings of 2014 on Whirlwind Records ("Views From The Inside"). On Rhodes is the fine young player/composer Landon Knoblock and the drummer is Jared Schonig (who is 1/3rd of the Wee Trio). The music Smith composes has its roots in "prog-rock" (the short opener "Mega" shows the influence of King Crimson), the "big-band" rock sound of Chicago, the music of John Hollenbeck, a touch of Frank Zappa, and 20th Century classical music. With such short songs, the solo space tends to be diminutive but each solo, whether it's 4 bars or 2 verses, stands out. "Dark Matter" has saxophonists Michael Thomas and Kevin Russell, trumpeter Josh Deutsch and trombonist Nick Finzer trading lines and then all soloing atop the forceful sound of their colleagues. Schonig and electric bassist Russ Flynn are the booster engines on "Rhetoric Machine", replete with fuzzed Rhodes and thick guitar chords (courtesy of Kenji Shinagawa). There are moments when the rapid-fire phrases played by the brass and reeds bring to mind the more electric sounds of the late Don Ellis as well as some of the music Buddy Rich made late in his career. This music just keeps coming at you, with the only exception being the solo piano opening of "Solace" but, once Knoblock falls into a groove and Schonig enters, the music goes wild all over again (great squalling horn arrangement). A hint of funk enters the mix on the oddly-timed "Spin", which features a sparkling alto sax solo from Chris Shade, flutes in the reed section and a rousing solo from Deutsch. The flutes are evident again on "Build and Destroy", swirling in the mix with the roaring brass and crunching sounds from the rhythm section. Although Nathan Parker Smith thanks Dave Rivello, Jim McNeely, Mike Holober JC Sanford, and Ryan Truesdell, all of whom write for or arrange or lead large ensembles, "Not Dark Yet" owes as much to the experiments of the Willem Breuker Kollektief and Robert Fripp as it does to anyone else listed above (at least, to these aging ears.) If there is are "star performers" on this CD, it's certainly Jared Schonig and Russ Flynn - they provide the power that fuels the brass, reeds, guitar and keys. This is blockbuster, even bruising, music with little respite on the program; such vigorous music might scare some folks away. Can't wait to hear this ensemble live - for more information, go to nathanpsmith.com. Saxophonist Dayna Stephens has developed into quite a force on saxophone over the past decade. Most people know him as a tenor player but on his new recording "Peace" (Sunnyside), he is featured on soprano, alto and baritone as well. Stephens has also become an impressive composer but, for this CD, he stashed his pen and chose to interpret 11 standards from the likes of Horace Silver, Astor Piazzola, Enrico Morricone, Henry Mancini, Dave Brubeck and others. Producer Matt Pierson brought in a stunning group of musicians to support the saxophonist. The rhythm section features Larry Grenadier (bass) and Eric Harland (drums); rounding out the group is pianist Brad Mehldau and guitarist Julian Lage. Not everyone plays on all the cuts ("Body and Soul" is just sax with bass and quiet drums) but this is really Dayna Stephens's show. The playful interaction of tenor and guitar on Mancini's "Two For The Road" while Mehldau meshes well with Lage on Antonio Carlos Jobim's "Zingaro." Stephens brings out the baritone for a delightful stroll with with the pianist and rhythm section through "I Left My Heart in San Francisco" - his feathery solo is one of the highlights of the recording. Mehldau really digs into his solo on the title track as does Grenadier while Lage's work on Sacha Distel's melody "The Good Life" stands out. The 2 Morricone pieces are from movie soundtracks. "Brothers" is from the 1986 movie "The Mission" and, at 1:44, is the shortest cut on the album. The lovely, classically inspired, melody is just right for the soprano sax and with both Lage and Mehldau providing counterpoint (and Grenadier holding down the bottom - Harland sits out), the music has a strong emotional pull. As does "Deborah's Theme" (from "Once Upon A Time in America") - Harland's cymbals, Mehldau's rippling piano lines, Lage's simple yet effective guitar fills and Grenadier's bowed bass all provide the framework for the sweet alto reading of the melody. "Peace" is mostly ballads but don't think for one moment that Dayna Stephens has sold out. He gives his accompanists plenty of room but doesn't shortchange the fan who expects lots of saxophone. No clutter, no muss or fuss, just classic melodies that play to the strengths of all the musicians involved. For more information, go to sunnysidezone.com/album/peace. 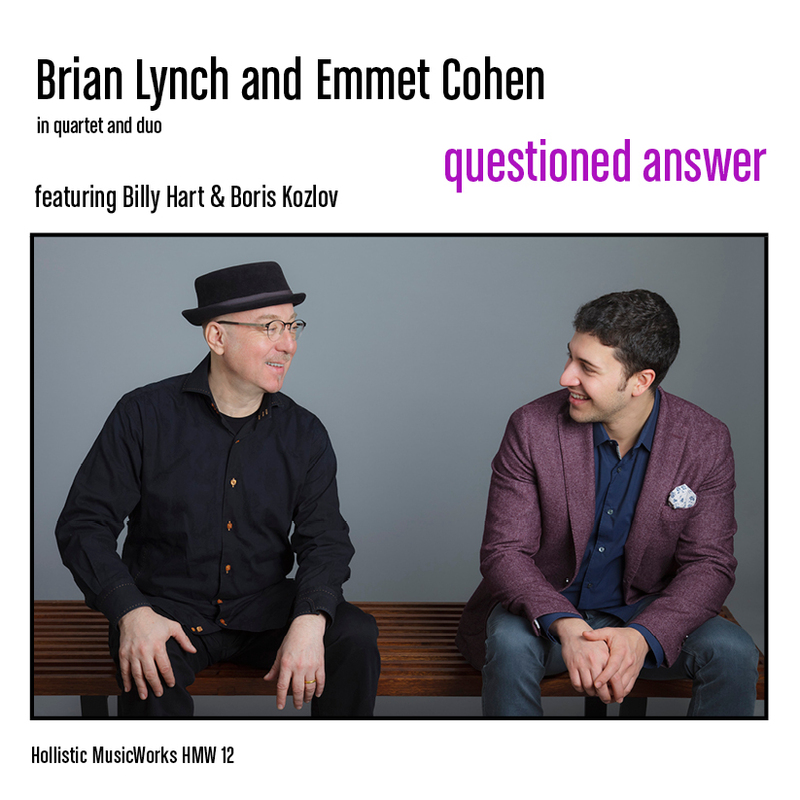 The first recorded collaboration Brian Lynch (trumpet) and Emmet Cohen (piano), "Questioned Answer" (Holistic MusicWorks), is one of the most enjoyable of this and any year. Comprised on 9 tracks, 3 of which are duets and 6 with the "ideal" rhythm section of Boris Kozlov (bass) and Billy Hart (drums), the music is exploratory, celebratory, introspective and downright exciting. Lynch met the young pianist when Cohen's Trio played a Jazz Cruise in 2011 and again when the trumpeter joined the faculty of the Frost School of Music at the University of Miami where Cohen was in his final year of his undergraduate career. Their proximity gave them ample opportunities to play together and Lynch soon became a mentor. Cohen had already recorded his debut CD (reviewed here) and come in 3rd in the 2011 Thelonious Monk Piano Competition. This new CD, recorded a year after they met, includes 3 original pieces each by Lynch and Cohen with the duo tracks of standards. The trumpeter's "Cambios" opens the album on a sprightly, hard-bop, rhythm pushed by Kozlov's solid bass lines and Hart's splendid cymbal work. Lynch's "Buddy" is a funky number (dig Hart's "in-the-pocket" drumming) with a wistful melody line. There's a touch of Herbie Hancock in Cohen's fine solo which incites the drummer to truly "play around", at times, as the pianist moves through his statement. Hart's cymbal splashes frame the sparkling trumpet solo. The title track, the 3rd Lynch piece, is a lively tune with a fine circular melody line. The trumpeter drives through his solo, interacting with the piano and pushing the rhythm section. Cohen's contributions include the intriguing "Dark Passenger", which opens with muffled piano notes before Lynch plays the flowing melody line. The pianist and trumpeter share the solo space in an extended call-and-response that displays how creative both can be. Hart's solo follows, a swirl of cymbals, rolls and thumps that leads to a return to the opening melody. "Distant Hallow" also has a mysterious feel in the modified montuno (expertly echoed by Kozlov) and a smartly-placed "straight-ahead" rhythm for the solos. Cohen rarely goes where one might expect, taking his time to decide how to move through the landscape until his phrases begin to lengthen. He drops back to allow Lynch to take over and the trumpeter digs right in, delivering a powerful statement. The third Cohen, "Petty Theft", opens with a lovely solo piano melody before the rest of the group enters and, despite the title, the music feels very modern, open chords, bass and drums moving independently of the trumpet while the piano moves in and out of the background (mid-to-late 60's Miles Davis Group comes to mind. The standards include an expansive reading of Irving Berlin's "How Deep Is The Ocean" (with quite the piano solo), a quiet and somewhat wistful "I Wish I Knew" (composed by Harry Warren and Mck Gordon in 1945) and a playful reading of "Just In Time" (the Sammy Cahn/Jule Styne tune) that displays Lynch's more melodic side. "Questioned Answer" has so much going for it, from the crisp interplay of Brian Lynch and Emmet Cohen to the first-class rhythm section to the young pianist's originality as a soloist, accompanist and composer. Lynch is no slouch as a composer and performer either. This is an album where the musicians inspire each other and it shows from the opening moment to the simple stick figure on the cymbals that ushers in the silence. You'll be able to listen to this CD many times and pick on something new each time you do. For more information, go to hollisticmusicworks.com. Here's a taste of "Distant Hallows"- Enjoy! To his credit, no two of pianist/composer Ezra Weiss's six CDs sound alike. He has recorded with a big band, with vocalists, did a tribute to the late Shirley Horn and written for young audiences. 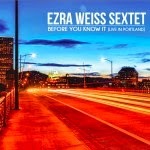 "Ezra Weiss Sextet: Before You Know It [Live In Portland]" (Roark Records) is the 7th and continues that trend. Now living and teaching in Portland, Oregon, Weiss leads an ensemble featuring Farnell Newton (trumpet), John Nastos (alto saxophone), Devin Phillips (tenor saxophone), Jon Shaw (bass) and Christopher Brown (drums) through a 8-song program (6 originals, 2 "standards") recorded live at Ivories Jazz Lounge. It's a generous recording (77 minutes) and, happily, goes in many different directions though one can detect the influence of Blue Note recordings from the mid-60s. The CD opens with the funky, slinky, "Winter Machine", with the handsome theme first presented by Nastos then supported by Newton and Phillips. Weiss joins his left hand with the bass and they support the front line while Brown pushes from below. Newton is impressive throughout - the young trumpeter, who has toured with Jill Scott and Bootsy Collins, has a crisp yet forceful sound and style (think Nicholas Payton) and is a pleasing foil for Nastos's more soulful sound and Phillips' fuller tones. Each one delivers a strong solo on the lovely ballad "Don't Need No Ticket" as does bassist Shaw (but, surprisingly, not the pianist.) The New Orleans-flavored "The Five A.M. Strut" is just that, a high-stepping strut that gets its bounce from the bassist's percussive work and the drummer's fancy footwork. It's the longest track on the CD (15:15), contains several splendid solos including one from Weiss that starts slowly in the lower half of the piano and slowly moves up on both the keys and in intensity. Of the "standards", the first is a pleasing reading of the Gershwin's "A Foggy Day" with handsome harmonies during the theme and a series of fine solos. The music swings yet there is a contemplative feel to the piece; one can just kick back to enjoy how the bass and drums really provide the spark to the soloists. Three cuts later, the Sextet enters the world of John Coltrane's "Alabama", the composer's lament for the four girls killed in the September 1963 church bombing in Birmingham. After the 5-minute rubato introduction, the rhythm section locks into the powerful rhythms first created by McCoy Tyner, Jimmy Garrison and Elvin Jones beneath Phillip's reading of the theme. The tenor saxophonist, a transplant from New Orleans, is the only soloist and Phillips pours his heart into the solo, slowly building to a mighty crescendo before the entire group returns for the heartfelt coda. The title track closes the program - it's a slow, soulful, blues that is more celebratory (composed before the birth of Weiss's first child) than cerebral, with a touch of Joe Zawinul's "Mercy Mercy" in the piano chords. It's a gentle reminder that music can provide a cushion in uncertain times. "Before You Know It" is a true band effort. In fact, Ezra Weiss does not not solo on every track but he creates the music and arrangements that gives his musical cohorts the freedom to have their "say." Enjoyable and honest music, this CD is worth your attention. For more information, go to ezraweiss.com.